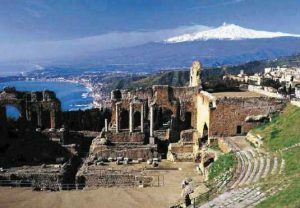 There is a reason why Taormina is still named as “the pearl of Sicily”. As soon as you arrive in Taormina, you will feel the magical, mythical atmosphere spread all around which has enchanted visitors from all over the world for years and years. Settled on a hill of the Monte Tauro, Taormina dominates two grand, sweeping bays below and on the southern side, the top of Mount Etna, the highest European active volcano, often capped with snow, offering to the visitors a breathtaking, dramatic and memorable view over almost one hundred miles of Mediterranean sea. Founded by colonists from Naxos, the ancient Tauromenion, Taormina continued to rank as one of the more important towns of Sicily after the fall of the Western Roman Empire. It was taken by the Arabs in 902 after a siege of two years and the Muslim rule of the town lasted until 1078, when it was captured by the Norman count Roger I of Sicily. The town still retains much of its Medieval character intact. Starting from the 19th century Taormina became a popular tourist resort in the whole of Europe: people who visited Taormina include Oscar Wilde, Nicholas I of Russia, Johann Wolfgang von Goethe, Nietzsche, Richard Wagner, D.H Lawrence, Truman Capote, Bertrand Russell and Tennessee Williams. During the ‘50s and the ’60s Taormina enjoyed La Dolce Vita with famous celebrities from all over the world. the most remarkable monument remaining at Taormina is the Ancient Theatre, which is one of the most celebrated ruins in Sicily, on account both of its remarkable preservation and its beautiful location. Settled on a hill of the Monte Tauro, Taormina dominates two grand, sweeping bays below and on the southern side, the top of Mount Etna, the highest European active volcano, often capped with snow, offering to the visitors a breathtaking, dramatic and memorable view over almost one hundred miles of Mediterranean sea. Placed at the foothill of Mt Etna, Catania is the second biggest city in Sicily, a dynamic and lively city founded in the 8th century BC as a Greek colony of Chalcidic origin the 14th century and the Renaissance, Catania was one of Italy’s most important and flourishing cultural, artistic, and political centers, seat of the first university in Sicily, opened in 1434. Destroyed in 1969 owing to a he lava eruption and later in 1693 for a heavy earthquake, the city was then rebuilt in the Baroque architecture that nowadays characterizes its buildings and monuments. For it magnificent Baroque style historical centre, Catania is included in the Unesco World Heritage list. Proceed to Taomina, the pearl of Sicily. 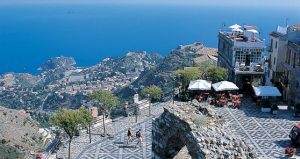 As soon as you arrive in Taormina, you will feel the magical, mythical atmosphere spread all around which has enchanted visitors from all over the world for years and years. Settled on a hill of the Monte Tauro, Taormina dominates two grand, sweeping bays below and on the southern side, the top of Mount Etna, the highest European active volcano, often capped with snow, offering to the visitors a breathtaking, dramatic and memorable view over almost one hundred miles of Mediterranean sea. Mt Etna is the biggest active volcano in Europe currently standing 3,329 m (10,922 ft) high, though this varies with summit eruptions. According to Greek mythology, the deadly monster Typhon was trapped under this mountain by Zeus, the god of the sky, and the forges of Hephaestus were said to also be located underneath it. Driving through along the foothill of the volcano we will reach an altitude of 1,810 meters in an area called “Piano Provenzana” warped by the lava flow from the eruption on October 27, 2002. 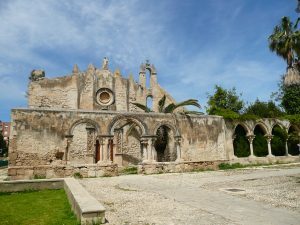 Taomina is our next stop As soon as you arrive in Taormina, you will feel the magical, mythical atmosphere spread all around which has enchanted visitors from all over the world for years and years. Settled on a hill of the Monte Tauro, Taormina dominates two grand, sweeping bays below and on the southern side, the top of Mount Etna, the highest European active volcano, often capped with snow, offering to the visitors a breathtaking, dramatic and memorable view over almost one hundred miles of Mediterranean sea. Driving through the so called lava villages, you will reach 1900 mt above sea level on the southern flank of the volcano, for light walk along the Silvestri craters. You may decide to get the cable-car up to 2500 mt and then by off road buses up to 2900 mt to admire the fantastic lunar landscape close to the main crater! Proceed to the north-eastern flank of the volcano for a visit to top boutique winery set on Etna’s slopes at an altitude of 700 metres above sea level. The estate belongs to an important noble family involved into wine making since 1726. The vineyards slope down towards the sea into a natural amphitheatre and produce excellent D.O.C. 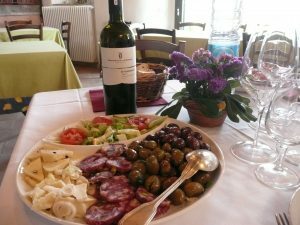 Etna wines. The characteristic mountain climate, the particular exposition, the presence of bordering oak and chestnut forests create, besides an enchanting landscape, a “unicum” for the production of wines with a marked personality. Syracuse is famous for its rich Greek history, culture, amphi-theatres, architecture, , and as the birthplace of Archimedes. This 2,700 year-old city played a key role in ancient times, when it was one of the top powers of the Mediterranean world. Once described by Cicero as “the greatest Greek city and the most beautiful of them all”, it later became part of the Roman Republic and Byzantine Empire. In the modern day, the city is listed by UNESCO as a World Heritage Site along with the Necropolis of Pantalica. The Archaeological Park of Neapolis includes the most spectacular Greek and Roman monuments bearing testimony to the past of Sicily: the magnificent Greek theatre; the Nymphaeum zone; the sanctuary to Apollo; the imposing altar of Hieron II (king of Syracuse in 265-215 BC); the Roman amphitheatre; the great stone quarries, also known as the lautumiae. The island of Ortigia is the historical heart of the town, with its nice Baroque-style buildings, palaces and narrow streets. Here, you will find the Cathedral, former a great temple devoted to Athena, the Fountain of Arethusa planted with papyrus, the Galleria Bellomo Museum where the Annunciation by Antonello da Messina is kept (optional) and the Badia di Santa Lucia, near the Cathedral, home of the Caravaggio’s Bury of St. Lucy. Your guided tour starts in Acradina, the site of the earliest Jewish settlement. We will visit the Catacombs of S. Giovanni and the Crypt of S. Marciano, who, according to legend, was killed by the Jews of the city. Then, we’ll move to the island of Ortigia and stroll through the narrow streets of the Giudecca , the ancient Jewish quarter. You will visit the site of the Synagogue and the Miqwà, a Jewish ritual bath, 11 metres below ground level and the most archaic that has ever been found in all of Europe. A visit to the ancient Neapolis, the archaeological area will include the most spectacular Greek and Roman monuments bearing testimony to the past of Sicily: the magnificent Greek theatre; the Nymphaeum zone; the sanctuary to Apollo; the imposing altar of Hieron II (king of Syracuse in 265-215 BC); the Roman amphitheatre; the great stone quarries, also known as the lautumiae.